BEACH BLANKET READING #5: TREASURE HUNT! What better place than the beach to dig for treasure? After reading HOW I BECAME A PIRATE by Melinda Long and David Shannon, (Harcourt) (5 and up) and ROGER THE JOLLY PIRATE by Brett Helquist (famous illustrator of Lemony Snicket's Series of Unfortunate Events (HarperCollins) (5 and up), divide the kids up into groups and give them each a small box to put something "valuable" in. Then crumple up butcher paper and let each group create their own "treasure map" as they find a hiding place for their booty. Let the groups exchange maps, and let the search begin! If the interest in treasure hunting is piqued, be sure to recommend Betsy Byars' realistic fiction THE SEVEN TREASURE HUNTS (HarperTrophy) (all ages). And if it's treasure ye seek, Walter Wick's eye-candy seek-and-find book I SPY TREAURE HUNT by Jean Marzollo, illustrated by Walter Wick (Cartwheel) (7 and up), which has enough baubles and bangles to tantalize a whole shipload of treasure-seekers! If you would like a gentle wind-down after piratical adventures, try THE MAGGIE B. by Irene Haas (Margaret McElderry), a classic cruise through the imagination of a little girl (ages 4 and up). More pirate-themed books to shanghai your child's imagination! And many will be happy to know that the latest in the popular "ology" series has been released, PIRATEOLOGY edited by Dugald A. Steer (Candlewick), a work of nonfiction that holds kid-treasure better than gold: working compass, pocket sundial, jewels and gems, and maps leading to what else but more treasure? If you enjoy this book, you will also enjoy the scrapbook style PIRATES by John Matthews (Atheneum), full of even more maps, historical facts, and a wanted poster for none other than Blackbeard himself. Both are best suited for children ages 9 and up. You can knock the sand out of your shoes...this concludes our week at the beach at PlanetEsme! Hope you had a sunny time, and found reading treasures to boot. We will return next week to our regularly scheduled program: reviews of the best brand new books! I was a little later than usual posting for Book-a-Day today, because I had to prioritize going over the final, final, FINAL proofs of my new novel, VIVE LA PARIS, with my editor. It occured to me that it felt like little bit like working under a car for a very important customer, making sure every nut and bolt and spring is tightened and oiled, that the fenders are gleaming...so many miniscule adjustments! I am so excited, and hopeful that this book is the very best it can be. I have come to really love my main character Paris and her family, and I hope you will, too! I also hope this will be a useful tool for discussions about peace and bullying...but more on that later! Many of you have gotten a sneak preview with the Round Robin promotion that was announced last month. I have my fingers crossed that you liked what you read, and thank you with all my heart to those who have spread the word! If you signed up for the Round Robin and have not yet recieved the book, please let me know via my e-mail, esmeatripcodotcom. Merci beaucoup! Back to the beach! Today let's celebrate the not-so-chicken of the sea: mermaids! If you have real sand to play with, half bury the children and let them form fishtails from the waist down; let them decorate in patterns using shells and stones. If you happen to be on an imaginary beach, from the waist down, wrap the child's legs loosely in blue or green cellophane (Saran Wrap comes in pretty colors these days). Once the form is made, if you are generous enough with the cellophane,the child should be able to slip in and out of their "tails." Fashion fins at the bottom out of a fan, a plastic plate or more cellophane. Let thechildren decorate the tail by attaching seaworthy decorations, like strings of deep-sea pearls, glitter-covered shells and leafy seaweed. Are mermaids extinct? They are definitely at least endangered in the world of picture books and folklore collections. My own favorite mermaid story is the unusual japanese legend "The Kingdom Under the Sea" retold in MAGICAL TALES FROM MANY LANDS by Margaret Mayo, illustrated by Jane Ray (Dutton), which is crazily out of print, as is Mary Pope Osbourne's MERMAID TALES FROM AROUND THE WORLD illustrated by Troy Howell (Scholastic), Kate Spohn's glittery THE MERMAIDS' LULLABY(Random House), the rare mer-man story NICHOLAS PIPE by Robert D. San Souci, illustrated by David Shannon (Dial), THE MERMAID OF CAFUR by Evelyn Foster, ilustrated by Olwyn Whelan (Barefoot) and Shirley Climo's TREASURY OF MERMAIDS, luminously illustrated by Jean and Mou-Sien Tseng. All out of print! Isn't that fishy? Luckily, all good mermaids carry library cards, and hard-core collectors can get copies at AmazonZshops. Andersen's sorrowful saga of THE LITTLE MERMAID, (just get a beautiful version like Lizbeth Zwerger's; please avoid the Disney version, which I always felt made her look like such a little sea-hussy instead of the complicated young woman that she was). And, perfect timing, MERMAID SUMMER by Mollie Hunter (Harper) (10 and up, featuring one mighty fresh half-fish). Links are provided for informational use. When buying new books, don't forget to support your local independent bookseller. The sun continues to shine high and hot in the sky, and here at PlanetEsme, we are still on the beach! Read fishy stories like the magnificent BIG AL by Andrew Clements, illustrated by Yoshi (Simon and Schuster) about the biggest, scariest fish in the sea who would like nothing better than to make friends (4 and up, and boy how they scream if you say "The End!" after Big Al is caught in the net), SWIMMY by Leo Lionni (Knopf), the classic tale of undersea cooperation (4 and up), THE RAINBOW FISH by Marcus Pfister (North-South) about a vain and selfish little flipper who gets the zen-like (or is it Trump-like?) message from an octopus that you have to give in order to get (4 and up) and/or the brand-spanking new DEAR FISH by Chris Gall (Little, Brown) (6 and up). Uniquely and boldly illustrated with digitized clay engravings, it shows a world in which undersea creatures join us on land after recieving a message in a bottle from a little boy. The surreal imagination is akin to David Wiesner, and with nonfiction notes on the endpapers for reference and a hunt for ten fishy puns within these pages, there are plenty of hooks to catch young readers. There are plenty of wonderful, water-ful crafts you can do with a fishy theme; an easy favorite of mine is a brightly crayoned seascape, painted over with turquoise watercolors. Never fails to get an "oooh-ahhh!" from the kids! Or, collage an under-the-sea-scene in a clean styrofoam meat tray, and then cover it with blue cellophane. For a fun game, let children design their own fish on posterboard. Cut them out and stick a little piece of magnet tape (sold at craft and office supply stores) on the back of each of them, along with a number from one to ten of the child's choice. Then, with a long stick with a string an magnet attached, let the children go "fishing." Who can score the most points after three tries? If you secure the fish in zip-lock bags, you can let kids "fish" in a wading pool! When the game is done, attach straws or craft sticks to the back of the fish with some tape, and they can double as puppets so children can make up their own fish tales. Okay, okay, I know some people are allergic to THE RAINBOW FISH, but if you cut out prismatic paper fins to pass out at the end of the story, it might help ease the discomfort. Also, check out the provocative article by Heidi Estrin about secular books that teach sectarian values, "Is the Rainbow Fish Jewish"? (Also available as a PDF if you search the title on Google). Thanks to those who have been adding their own recommendations to these posts in the comments section, you know they are always welcome and appreciated! Today we continue our week's worth of seaside fun by playing in the sand! After reading PLATYPUS by Chris Riddell (Harcourt), in which our little hero goes beachcombing to find just the right addition to his collection, go on a scavenger hunt for items like a rock with a fossil on it, a bird feather, a shovel, a shell no bigger than a fingernail, or, any of the items from my very favorite piece of summery non-fiction, THE BEACH PATROL by John O'Brien and Max Bilkins (Henry Holt) (also a great choice for aspiring lifeguards ages 6 and up). If you're at home scavenging, try things like a slotted spoon, a penny from 1974, a book with a title starting with the letter B, or a yellow ponytail holder. After reading SAND CASTLE by Brenda S. Yee, illustrated by Thea Kliros (Greenwillow) or SUPER SAND CASTLE SATURDAY by Stuart Murphy, illustrated by Julia Gorton (HarperTrophy), children can create their own sand art using craft sand, available through Oriental Trading Company (search keyword "sand") and craft stores. Using empty baby food jars or other clear containers, children can layer the colored sand to make beautiful sunset-like creations. If you have extra jars, you can make an "ocean in a bottle" by filling the jar halfway with water, adding blue food coloring, and filling it almost to the top with vegetable oil or mineral oil. After screwing the lid on tightly, move the jar back and forth to see the waves! If this floats your boat, there are tons of simple and delightful science activity tie-ins at Perpetualpreschool.com. Another fun sand activity is sand painting, instructions courtesy of one of my all-time favorite links, Thebestkidsbooksite.com. "Tales of a Fourth Grade Nothing!" Since someone named the author of Captain Underpants, the list starts anew. How long can the list grow? How many authors or illustrators do the children know? You can also try to call out all books by one author; how many of Dr. Seuss's books can the children name? Lemony Snicket's? Beverly Cleary's? Mancala is an ancient game from Africa that is fun and easy to play on the beach using clamshells or small stones, and digging the "playing board" into the sand, using shells or stones as pieces, or by making your own board at home; they are also available relatively inexpensively at toy stores. Rules for playing mancala may be found here or here. Once you know how, it's absolutely addictive; you'll never play checkers again! You may want to include a reading from Verna Aardema's retelling of the African folktale set at the beach, BIMWILI AND THE ZIMWI (Penguin) (which may be a bit scary for younger children, but suspenseful for some; read it yourself and decide!). In the brilliant storytime resource book I'M A LITTLE TEAPOT! by Jane Cobb (Black Sheep Press), the author suggests taking a conch shell after reading Bimwili and letting all the children listen to it, and then using the story as a springboard for examining all different kinds of shells (a great chance to incorporate guide books!). For a keepsake of this sunny, funny day, let each child trace a foot on a piece of thin sandpaper (available in sheets or rolls at hardware and home improvement stores) and cut it out. Punch a hole and tie on some raffia and a seashell with a hole in it to complete a beachy bookmark! With a heat wave sweeping across the country, I think it's time we hit the beach (bikinis optional, thank goodness)! All week long we're going to get wet and wild in bibliophile-style via recommendations and crafts suitable to the season. For those of us lucky to live close to an ocean or lake, reading can be held along the shoreline, but folks without such a luxury can still enjoy reading without the harmful UV rays! Break out the beach blankets, big umbrellas and sunglasses to create a big splash, even if it's just spread out across the living room floor or alongside a wading pool in a backyard. Remember, if you do take books to the beach, you may want to put them in gallon-size ziplock bags to keep them in good condition. Hold on to your hats and visors, there's more to come! I have a question! I've recently started working in a suburban public library. The branches are staffed mostly by associates - no librarians trained in or dedicated to helping children. My concern: Our customers, young and old, are really culturally diverse - but one thing most have in common is that they don't know how to browse. How do I teach them to find "something that looks good" on a shelf? I've come up with several possibilities for the inhibition (they're polite, afraid to touch, or overwhelmed by choice) as well as several impossibilities (they're ignorant, bookphobic, or hopeless). Solutions? 1) I've considered creating a brief scavenger hunt. Like, "Let's find the biggest book on this shelf. The smallest. The prettiest/ugliest. A book for a boy/girl. A book with pictures/no pictures inside. A red/blue/green book." SOMETHING that would get them looking at the trees instead of the forest and encourage them to interact with the books. Unfortunately, though, I don't usually have the luxury of spending enough one-on-one time to do this. 2) In a pinch, I've also tried the quick-and-dirty option often recommended for feeding or dressing toddlers. I pick up 2 books, smile big, and say, "Which of these would you rather read?" But this is more coercive than reader's advisory is probably supposed to be, and I've only done it when Mom/Dad requires a choice and the clock is ticking. SO: Is there a 30-second solution? How can I encourage a roving reader? Everybody has preferences - how do these translate into considering books? First of all, kudos to you for the work you do and the efforts you have made. In all walks and strata of life, people are largely unenlightened in regard to the riches of reading, and uninformed as to the protocol that would allow them to make the most of this amazing resource that is the library, creating the special challenge that you describe. I describe a motivation theory, a five-finger test, how to keep book-leveling in perpsective and other things of interest in HOW TO GET YOUR CHILD TO LOVE READING (available at your local library! And will turn your associates into experts), but today I'll focus on a more immediate solution that speaks directly to your needs. I think your possibilities are insightful, especially the feeling of being overwhelmed. I have often compared being faced with a wall of unfamiliar books as similar to being handed an extensive menu of some exotic, foreign cuisine. You know something on that menu is good, possibly delicious. But how can you choose when you aren't even sure what you're choosing? Maybe you'll order something divine, a delicacy that suits your unique palate! Or, just maybe, you'll unsuspectingly pick something from a part of the animal that shall go unnamed. It's enough to stop anyone in their tracks. A patron may be set back in motion when they are reminded that they don't have to be so invested in any one choice. I think one approach that you, as professional book-sharer may find helpful is to remember that these are not just patrons but consumers, and, if they are American, they are likely very fervent consumers in other areas of life. I suggest you play into that role, where they may have more confidence. If at all possible, acquire tote baskets from a library supply company like Demco (search using the word "basket," and you'll find browsing baskets, tote baskets and better baskets, all of which are suitable). What this does is suggest to the patron, "take all that you can carry!" Since there are many other "shopping" situations in which the patron may be more familiar or comfortable, they may naturally get the idea that taking more than one book is the norm (children certainly get the hint! ), and this is extremely important if they are ever to become avid consumers of books. By choosing books with abandon, they will encounter titles that they might not like as much as they thought they would. This is a good and natural thing: they can develop their own criteria and also see that it's okay, we don't have to choose the perfect book every time, and that indeed they are not expected to judge a book completely by its cover. Choosing more books also means they have a higher chance of encountering books that they do enjoy, and that, of course, will keep them coming back. The other thing you can subtly (or not so subtly) suggest to the patron is that the shopping spree scanario: if you could go into a store and you could choose anything you'd like, would you really just choose one single thing, or would you go crazy? At the library, hey, it's an endless spree! A library card is like a credit card with no interest rate except maybe overdue fines, and no annual fee, and everything you get with it is free, free, free...as long as you bring it back after a week or two. Work it, patron! Though it may feel gauche at first making such avaricious comparisons, just remember: for a number of people, books were encountered first (and sometimes only) through the formality of schools. It takes a lot to move folks out of the mindset of books as props in an intellectual setting (to paraphrase from Auntie Mame, "books are sooo decorative!") into reading as part of a lifestyle with which they can identify. Does anyone have other ideas and suggestions for the author of this letter? I know there are more. Please do share in our comments section. And if you have a question, please e-mail it with the subject heading "Ask Esme" to esmeatripcodotcom. Though I may not answer every question, you know that over time, I'll try! MASTERPIECES UP CLOSE by Claire D'Harcourt (Chronicle) Over twenty paintings are reproduced in oversized format, with an invitation to scavenger-hunt for details; kind of an epicurean Where's Waldo that will inspire close inspection of great works of art. In the business of children's literature, there are two big seasons: spring/summer and fall/winter. And here is a term within the industry: a "window," or an all-too-short period of time in which a book is given publicity attention before the publisher begins to focus on the books in the next season. With the competition of thousands of new children's books released annually and publicity budgets and talents varying greatly, it's only natural some titles fall under the radar. With that in mind, though I will continue my ever-vigilant up-periscope on the brand-spanking new, every now and then I'd like to mention a contemporary book that may not be out just five minutes ago, but that is so wonderful I'd like to make sure you know about it. This is such a book. Okay, and if we're going down that street, would you please treat yourself to Jane Yolen's amazing, FAVORITE FOLKTALES FROM AROUND THE WORLD(Pantheon)?At five-hundred-some pages, it's a chef doerve of research and retelling. This education-in-a-book is a must-have resource for teachers, storytellers, and fans of Andrew Lang's BLUE FAIRY BOOK. Good grief, it's like getting a box of chocolates with four layers! To my wonderful husband, Jim Pollock, I hope you had a happy, happy birthday. I wish you many more, and that all of your dreams come true. If I could choose just one adjective to describe this book, it would be "playful." Here, the spirit of children is celebrated: the ability to find each other, to make friends, to invent worlds. The story of a summer spent together is told in four voices, color-coded for read-aloud, so each emergent reader in a small group can take a part (though it can also be read by a single talented adult). Though these children clearly have big things going on at home (it is suggested that one lives with her grandmother, one is in foster care, and one is in the neighborhood while her mother recovers from an illness), they are upbeat and undeterred from their imaginative lives, filled with tall tales, playground days and adventures in the town of "Goodsummer," an idyllic place invented out of paper and paint. In snapshots, we see their days both languid and lively, such as an afternoon covering eyes at a scary monster movie: "That was a great movie./That monster was mean!/That was the best movie/I have ever not seen." Or perhaps a punishment for going out of bounds: "The grown-ups had told us not to travel/beyond the corner tree./ When they looked, they couldn't find us,/now we're punished to remind us/not to forget to remember/where we're supposed to be." BIG TALK illustrated by Beppe Giacobbe (Candlewick) (7 and up), Newbery award winning JOYFUL NOISE illustrated by Eric Beddows (Harper) (8 and up), and ZAP: A PLAY (Candlewick)(12 and up). There are some books you like and some books you just love, L-O-V-E, the kind of book that makes a school librarian's heart beat faster and count the days until September...and this is one of them. This wonderful story is the account of a lion who wanders into the library and is actually an ideal patron, once he learns that loud roaring is against the rules. When uber-librarian Miss Merriweather takes a tumble from her step-stool and all demure Lassie-like attempts to get help by the lion fail, he resorts to rule-breaking, offending an anti-lion administrator who has been waiting for just such an occasion to banish our hero. Will he ever be invited to the library again? I have felt for a long time that Kevin Hawkes was due for some Caldecott attention, and if he doesn't get a nod this year between LIBRARY LION and the charming WHEN GIANTS COME TO PLAY by first-time author Andrea Beaty (Abrams)(4 and up), I just don't know what! By the way, if you read this book aloud, for a treat you can serve tea and giant rings (doughnuts) afterwards. It is also a great picture-book preface to Roald Dahl's THE BFG or Julia Donaldson's THE GIANTS AND THE JONESES (which I strongly recommended a few blog entries back, I certainly hope you listened to me). Being smart can be about more than doing well in school. Using Dr. Howard Gardener's multiple intelligence theory, the author celebrates the many ways that people can be smart: body smart, logic smart, music smart, nature smart, people smart, picture smart, self smart and word smart. Each kind of smart is exemplified in a short biographical portrait containing a quote from a notable individual , a poem, and a paragraph-long description of the subject's life and accomplishments. At the end of each passage, the author invites the reader to ask, "Are you like...?" and they will be eager to compare themselves to this decidedly multicultural "who's who," containing such effervescent talents as scientist Ynés Mexia, architect I.M. Pei, Explorer Matthew Henson, musician Tito Puente, among others, a shining dozen all together. Speaking of must-have, if your school has a budget for guest authors you must have this author, W. Nikola-Lisa! I will never forget the rainy afternoon he spent at the PlanetEsme Bookroom, in which he entranced a roomful of people for a timeless hour, reading not only his own books but the books of many others. He played music and cast everyone under such a charismatic, magical bookloving spell that we had to wonder, "television? What's that?" Truly, for his special gifts of not only writing fine books but getting folks to love reading, this man is a national treasure. Look at this guy! Clearly, he knows what kids like. My 10-yr-old son is very particular about the books he loves. Since his favorite genre is fantasy and I don’t read much of that at all, I’m of little use in recommending books to him. All fantasy looks alike to me. But my son is more discerning. He likes fantasies that happen in the real world. Is there a word or category for that? He loves the idea that magic or fantasy can happen to real people, like him! His favorites are Harry Potter and the Animorphs. He also already read all the Narnia books. He has also read and enjoyed Edward Eager and some of Bruce Coville. And to explain further, a book he couldn’t get into (no matter how good it is) was THE WALL AND THE WING because the whole book is fantasy. There isn’t a real world that bridges to the fantastical world. What should I recommend for him next? Thanks for your advice! Love your blog! And love you, too! When a strange little man sets up a tent at a county fair, four everyday folks spend fifty cents to make their wishes come true, exactly as they ask for them...and irrevocably. This cliffhanging fantasy is one of my very favorite read-alouds of all time! A professor leads children to Whangdoodleland in search of an endangered species. Fans of Narnia will get a kick out of this imaginative offering, written by the famous actress before celebrity books were the norm (and before they were so dadgum awful). Though you mentioned your son already liked Bruce Coville, I wanted to make sure you are acquainted with this prolific talent's "Magic Shop" series. In this book, a strange egg bought at a magic shop produces unusual offspring. The first book in the series, THE MONSTER'S RING, is a bit spooky, so for some, JEREMY THATCHER is a more subtle, magical entryway. Coville has a knack for the goosebump as well as the funny bone, and has female protagonists in his casts; check out JULIET DOVE, QUEEN OF LOVE. A homely, unpopular orphan gets her hands on a powerful library book, and then, look out world! Unfortunately, a criminal genius is hot on her heels, looking to do more than borrow the precious tome. Snarky voice and breakneck action will make the reader anything but sleeeeepy. A boy uses a magical playset in his attic as a means to try and keep his beloved nanny in the family, whether she wants to be or not. With carefully drawn and often powerful characterization, this is a contemporary to Lynne Reid Bank's popular INDIAN IN THE CUPBOARD, also about toys that come to life. Of course, there are many more wonderful titles... Andrew Clements' THINGS NOT SEEN, Jane Langton's THE FLEDGLING, or Natalie Babbit's immortal TUCK EVERLASTING...readers, chime in with your favorites in the "comments" section! Hope these titles help your son, and many other children, have a magical summer of reading. If you enjoyed this "Ask Esme" feature, you'll find many more examples of the reading advice column in HOW TO GET YOUR CHILD TO LOVE READING. I'll try to answer about a question a week here on the blog; please submit your stumpers to esmeatripcodotcom, with the subject heading "Ask Esme". Though I can't promise to answer every question, you know I'll try! I was adopted from a shelter. I love the couch. It is mine. The chairs and bed are mine, too. At night I sleep between my owners. They gave me a pillow of my own. 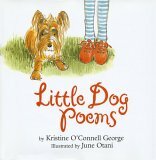 Ummmm, you're kind of cheating if you read the above book and don't also check out the original charming canine confessional, LITTLE DOG POEMS by Kristine O'Connell George, illustrated by June Otani (Clarion). Did you know that this author also has one of the best poetry websites around?